WASHINGTON - The caller with the Jamaican accent told the 90-year-old Washington man he had won $72 million and a new Mercedes Benz in the Mega Millions lottery, but the man needed to send $50,000 in taxes and fees to get his money. He also told the Washington man he'd done his research on the top winner. 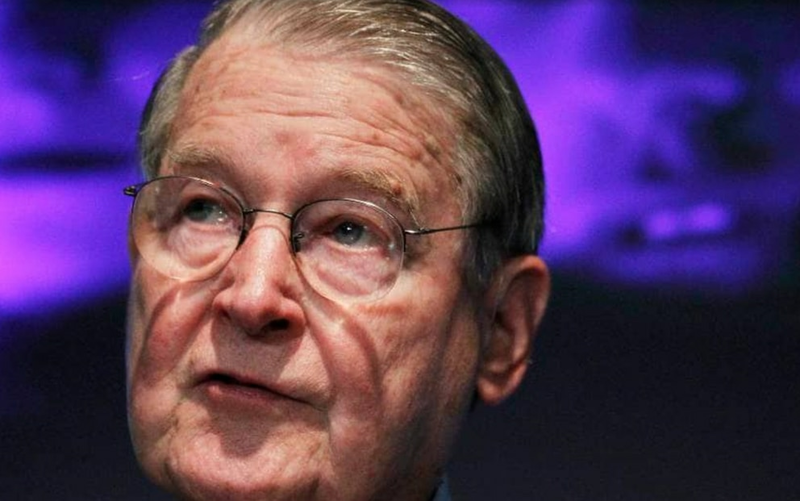 Former FBI and CIA Director William Webster, 90, performed a reverse phone sting in 2014 to help the FBI catch a man scamming older Americans out of their money. The Jamaican's research didn't research everything. He didn't learn that the man he was calling was the former director of the FBI and the CIA, the only person ever to hold both jobs. And he didn't know that William Webster would call him back the next day with the FBI listening in. In that reverse sting, Webster obtained the man's real name and email address, while stringing him along and never quite committing to sending the $50,000. "It's going to take me a few weeks to come up with it," said Webster, also a former federal district and appeals court judge. "I'm as anxious as you are to get the money, but it's going to take me a while to do it." "You can pay a part in the meantime," parried the caller, later identified as Keniel Thomas. "How much is a part?" asked Webster. "You can come with about $20,000 in the meantime," Thomas said in the recorded call that is part of the court record. "The threat of death to another person is a most serious crime," Webster told the judge, "for which Mr. Thomas is about to pay. . . . We truly hope that word has spread into the criminal community of scammers that our Federal Bureau of Investigation and other law enforcement agencies are clamping down on such predatory behaviors." Jamaican-based telephone scams have mushroomed in recent years, often targeting older or vulnerable Americans and sometimes destroying victims' lives. Inevitably, the caller promises large winnings in exchange for a payment of taxes or fees by the American. In Alexandria, Virginia, an 85-year-old man lost his home and his life savings. A woman in North Dakota lost more than $300,000. A man in Knoxville, Tennessee, committed suicide after sending thousands to a Jamaican group, according to CNN, which first reported Webster's role in the Thomas case. Federal authorities pursue the scammers when they can, but extradition from other countries is difficult and prosecution can take years. The FBI was able to document that Thomas, 29, from St. James Parish in the Montego Bay area, collected at least $300,000 with his scam from about three dozen victims, according to court records. One victim estimated that he sent Thomas more than $600,000. In order to cover his tracks, Thomas sometimes laundered money through different victims, having one American send money to a second American before it was sent to him in Jamaica. He provided Webster with the name and address of a man in California to whom Thomas wanted Webster to send the money, according to the recorded call Webster made. The scammers often pass around or sell "lead lists" of potential targets in America, prosecutors told The Washington Post last year, and Lynda Webster said they have continued to receive calls even after Thomas' arrest. The Websters were unlikely to fall for such fraud, "but it's frightening when they talk about putting a bullet in your head," she said Monday. The calls to the Webster home started in March 2014, with various men calling to tell William Webster he had won the lottery. In June, Thomas began calling, identifying himself as "David Morgan," a manager with Mega Millions. However, Webster saw that he had an email address of keniel.thomas@outlook.com. He asked "Morgan" to stop calling, but Thomas not only continued to call but also sent more than 20 emails to Webster. At one point in July 2014, Thomas called Lynda Webster and told her that he knew no one was at her home the previous night. In another call, Thomas told Lynda Webster, "So easy that we go set your house ablaze, how is that? . . . You can be taken care of that easy." The FBI was able to link the Websters to other victims who had reported sending funds to Thomas or interacting with "David Morgan," or who had sent funds to American middlemen who were also victims. Agents tracked payments through Western Union and MoneyGram to Thomas or members of his family, court records show. One California man reported receiving certified checks in exchange for sending "fees" to Jamaica, and wound up sending $85,000 to the scammers even though the certified checks all bounced. Franz Jobson, Thomas' attorney, said Thomas was disappointed that Howell had added 30 months to the sentence reached in the plea agreement with the government, and is considering an appeal. Anyone who thinks they may be a victim of a similar scam may contact the FBI's Internet Crime Complaint Center at ic3.gov.